At times, nothing beats the radio. 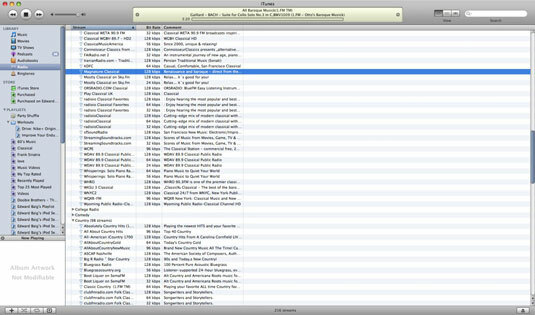 Fortunately, you can use iTunes to listen to Internet radio on your Mac. When you click Radio in the source list, you have access to streaming Internet radio stations, which gives you access to many more radio stations than you’ll find on AM, FM, or even subscription-based satellite radio. Apple categorizes these radio stations by genre. Click the triangle next to a category name to see all the station options in that genre. Double-click to tune in to a particular station. It starts playing in a few seconds, minus the static of regular radio. Pay attention to the bit rate. The higher the bit rate number, the better a station will sound, though you’re at the mercy of your Internet connection. Dial-up users may want to stick with stations streaming at less than 48 Kbps. You can include Internet radio stations in a playlist. Of course, you must still be connected to the Internet to hear them. Recording Internet radio streams requires a third-party application, such as RadioLover from Bitcartel Software. You can download an evaluation version of Bitcartel.